Ukrainian Orthodox Church of the USA - Parish Feast Celebration in Goshen, IN! Parish Celebration in Goshen, IN! 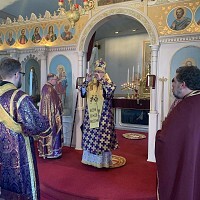 His Grace Bishop Daniel visited his God-Protected Ukrainian Orthodox parish of Holy Trinity in Goshen, Indiana on the weekend of July 10-11, 2010. As this was His Grace’s second visit to his parish in Goshen, many relationships had already been established and the parish eagerly awaited his arrival on Saturday evening for vespers. At the evening service, the bishop spoke about the need to develop our love for one another. As this was His Grace’s first pastoral visit since returning from the mission trip to Ukraine, he spoke about love in the context of the many orphans the mission team cared for in Ukraine. Bishop Daniel reminded his Hoosier flock that the mission of love is needed both within and external to Christ’s Holy Orthodox Church. After vespers, several faithful joined His Grace for a meal at a local restaurant where relationships were further expanded. A Hierarchical Divine Liturgy was served on Sunday, July 11 at the parish. The Bishop was led in procession to the temple where he was greeted by parish council president Geri Kreuger, vice-president Nelya Novachenko, and parish children. Father Taras Maximtsiv greeted His Grace with the cross and holy water. After the vesting of the bishop in the center of the temple, altar server Mark Brown was set-aside and tonsured as a Reader for Holy Trinity parish. Bishop Daniel reminded Reader Mark that the responsibility to read the Epistle readings in church no longer fell to the priest, a deacon or a cantor, but that it was his responsibility to bear and to execute faithfully. 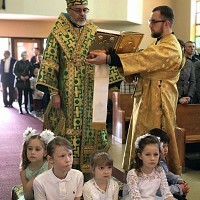 The remainder of this beautiful, ancient liturgy was celebrated by His Grace, Father Taras, and Father Deacon James Stickel, along with the well-trained Holy Trinity choir. Mrs. Lydia Karpenko was recognized by His Grace for her faithful contributions to the parish in Goshen. After Liturgy, the Holy Trinity faithful were joined by the faithful from nearby St. Mary’s Antiochian Orthodox Church for a picnic luncheon, where Bishop Daniel once again charged all of us to develop our love for one another. 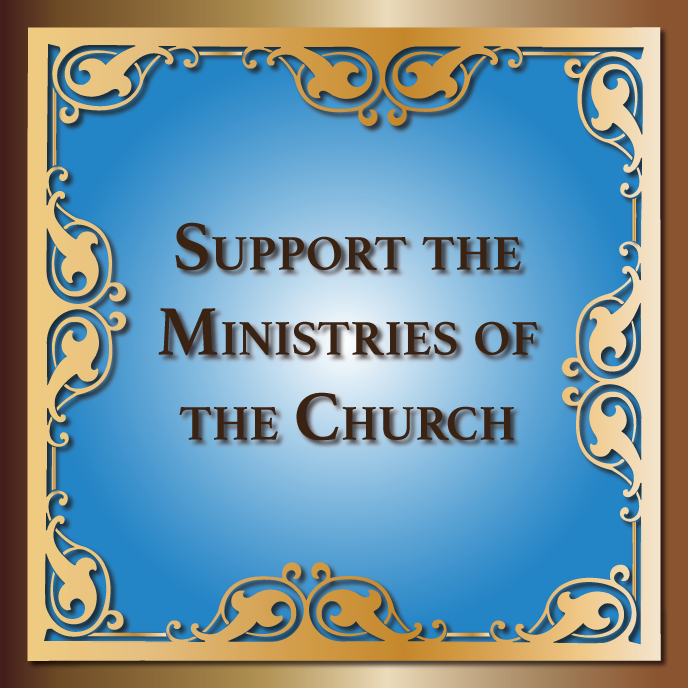 His Grace pointed out that Holy Trinity and St. Mary parishes had worshiped together for over a year and that these relationships should not be broken now that the two parishes are worshipping separately again. The bishop commented that he enjoyed the peaceful Goshen area, and it was light-heartedly suggested that he should move to Goshen and make Holy Trinity a cathedral. But alas, this was not to be. Afterwards, everyone left with a full stomach and plenty of good memories, as is typical whenever a bishop visits a Ukrainian Orthodox parish. Holy Trinity looks forward to the next visit of Bishop Daniel to his parish in Goshen, IN. Third Youth Sobor of our Holy Ukrainian Orthodox Church of the USA! Diocesan Church School Camp Completes Successful Year!